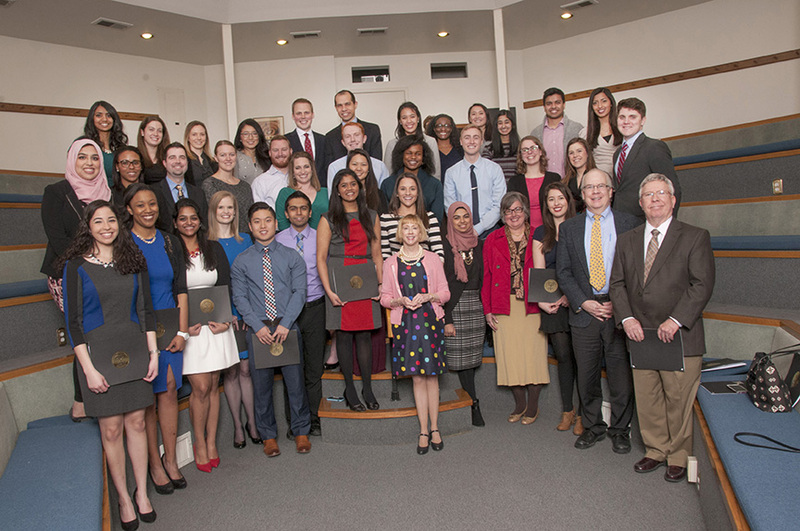 The School of Medicine inducted its 2016 class of Gold Humanism Honor Society members on Jan. 23. The School of Medicine chapter of the Gold Humanism Honor Society welcomed the 2016 class of students, residents and faculty members on Jan. 23 during its annual induction ceremony at Diastole. This is the 13th consecutive year that the UMKC chapter has recognized senior medical students, residents and physician teachers by their selection into the honor society. Those selected are chosen from nominations made by colleagues based on their excellence in clinical care, leadership, compassion and dedication to service. Members are selected for their exemplary care of patients and their humanistic approach to clinical practice. Established in 2004, UMKC’s honor society received funding from the Gold Foundation to create a Graduate Medical Education chapter specifically for residents in 2015. Today, the Gold Humanism Honor Society has more than 24,000 members. It recognizes 135 undergraduate medical education and 15 graduate medical education chapters at medical schools throughout the country. The society was established in 2002 by the Arnold P. Gold Foundation. Members are viewed by their peers as role models for humanistic care within their communities. The society also provides educational events, supports research, promotes professional growth and creates networking opportunities. 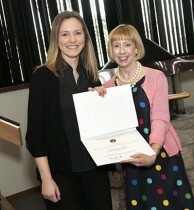 Kim Hartman, M.D., (left) received the 2016 Leonard Tow Humanism in Medicine Award from Gold Humanism Honor Society faculty sponsor Carol Stanford, M.D. Special recognition went to Kim Hartman, M.D., assistant professor of pediatrics, as the 2016 faculty recipient of the Leonard Tow Humanism Award. The award is given annually to one faculty member and one graduating student who demonstrate compassion in the delivery of care, respect for their patients and families, and for their colleages, as well as for demonstrated clinical excellence. The student award will be presented at the School of Medicine commencement ceremony in May.